Introduction: Circular staplers are often used to form a gastrojejunostomy. However, leaks occur 0.1-3% of the time resulting in serious morbidity and mortality. 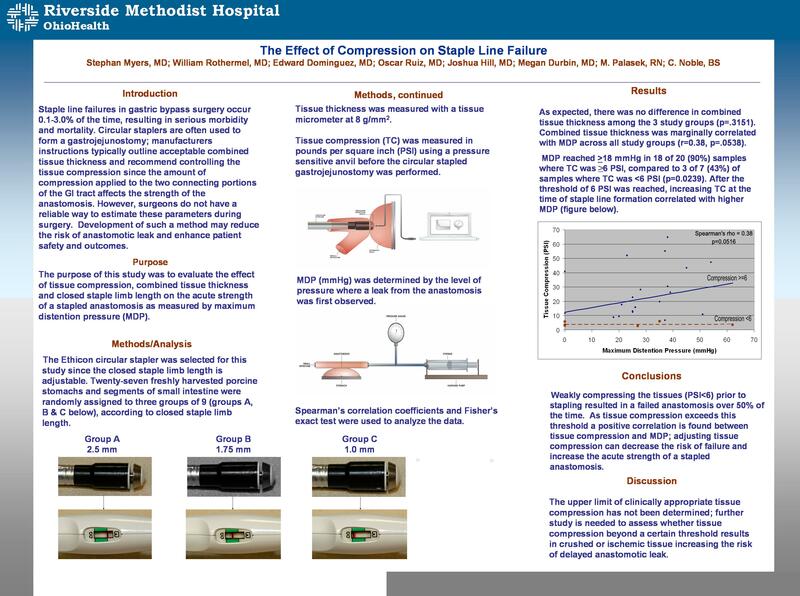 The purpose of this study is to evaluate the effect of tissue compression on the acute strength of a stapled anastomosis. Methods: Twenty-seven freshly harvested porcine stomachs and segments of small intestine were randomly assigned to three groups of 9, each set at different closed staple heights: Group A (2.5 mm), Group B (1.75mm), Group C (1.0 mm). Tissue compression (TC) was measured before circular stapled gastrojejunostomy was performed, while maximum intralumenal pressure (MIP) was determined following the formation of the anastomosis.